Throw away religion, upbringing, philosophy, what have you. Let’s say you were to come face to face with an alien today. Someone whom you knew wasn’t human, someone who you knew hailed from a different world. Maybe you’d be at peace with this. More likely, this would be shocking, upsetting and/or simply existentially troubling. If you were in a movie, however, it appears that there’d be a more immediate reaction from both you and your alien acquaintance. And more often than not, it would involve thoughtless violence. Why is this? Most summers feature their share of alien invasions, feeding our collective fear of the Other, though this summer has been particularly surprising in its treatment of this trope with the least amount of intellectual panache possible. Collectively, “The Avengers,” “Battleship” and “Prometheus” have revealed that we’re a long way from “Close Encounters Of The Third Kind.” A longer historical analysis could suggest this is Hollywood playing their part in a nationwide desire to avoid an understanding of the other side (ANY other side), though I fear that may be giving this recent slate of blockbusters far too much credit. Consider “The Avengers.” Generously crowded with larger-than-life characters, “The Avengers” nonetheless features two characters in Tony Stark (Robert Downey Jr.) and Bruce Banner (Mark Ruffalo) who have complementary viewpoints on scientific exploration. Banner’s approach is conservative, more careful, having improbably survived a flood of gamma radiation. Stark, who has been creating new formulas to prolong his own life, is far more cavalier, an explorer rather than a tinkerer. Of course, why is it that these characters’ most fascinating intellectual character quirks fall by the wayside when the greatest discovery of their lives, a full-blown alien race, overcomes the film? The racing narrative of “The Avengers” suggests these characters very reasonably shift into action figure mode for the climax as Iron Man and the Hulk, arguably the two biggest stars of this superhero team-up. It’s an inevitability that these two big brains would soon become unstoppable heroes and purveyors of collateral damage, though it’s a surprise that the film, written and directed by Joss Whedon, would also reflect the same attitude towards the revelation of the Chitauri. They go flying out of the movie almost as quickly as they enter, but as far as third act distractions, they pass the blockbuster smell test as targets for our heroes to hit. It’s just unfortunate that we don’t really see Stark and Banner’s philosophical reactions to this unending fleet of scaly, vaguely robotic soldiers from another dimension. It’s in-line with their reaction to Thor and Loki, gods from Asgard who may as well be aliens to this group, which is to say it’s very comic book-y, and not at all based on a fascination with outside forces. Then again, our heroes might as well be gods also, especially when the weakest member of this super team, archer Hawkeye, is firing arrows at our enemies with literal no-look precision. That leave the onus on the humans, all of whom react as extras are meant to in these movies - looking skyward in shock. Movie shorthand at this point, though wouldn’t it be something for these characters to react extremely poorly, instead of merely being cowed into submission? 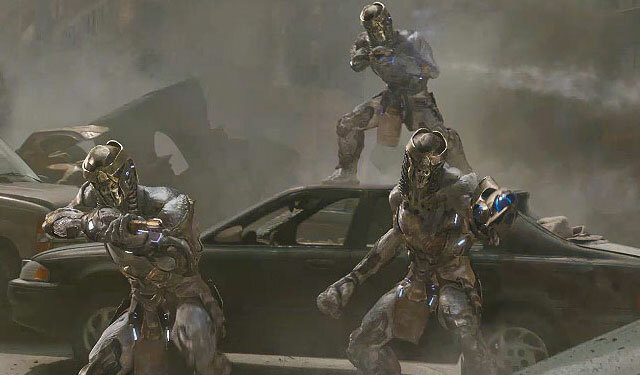 Marvel’s shooting a short film for the “Avengers” DVD featuring a human couple who claim one of the Chitauri’s guns and use it for their own vain, earthbound curiosities. Perhaps that fulfills the intellectual curiosity I’m seeking from this film, though “The Avengers” mostly works in spite of these intergalactic redshirts who conveniently happen to be a hive-mind (leaving behind a war-zone of alien bodies on Earth as the Chitauri homeworld deals with a nuclear bomb - what was it Stark said earlier about nuclear deterrents?). 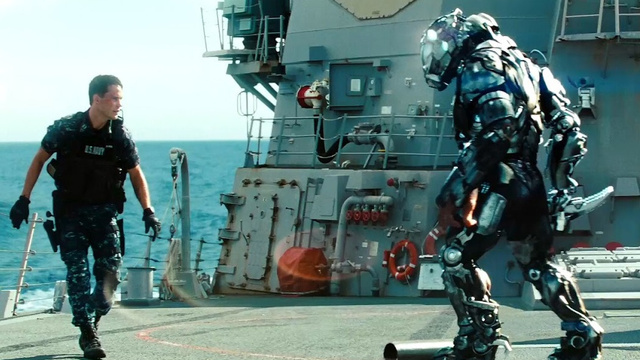 Later in the summer, “Battleship” came and went, featuring a first act featuring a compelling alien invasion scenario and then another hour and a half of narrative wheel-spinning. Unlike the warlike Chitauri, the beings of “Battleship” are fairly humanoid, looking like Brundlefly combinations of Mickey Rourke, Ed Asner and Superman villain Doomsday. While the physicality appears to differ from us in certain ways, they wear humanoid-like bodysuits, looking very much like Earthbound astronauts. Except there’s very little engagement with these beings, civilized or otherwise. When our heroes greet the imposing alien ship at sea, they play a blaring horn as an attempt at communication. When that correspondence is returned tenfold (the aliens’ aural assault destroys the windows on our naval ships), it’s somehow clear that the attack is on. The aliens withstand human fire in an attempt to draw first blood, before firing off ships to the mainland, attacking major cities. Unexplored are the scenes where we observe the aliens line of sight, very much like the visions in “Predator,” except that when they discover their combatants are flesh and blood, they opt AGAINST physical altercations. Their main plan seems to be to send a distress signal to their home planet, as their presence on Earth appears to be a mistake. That doesn’t stop them from making it a particular goal to destroy all buildings, bridges, and man-made constructions. It would be good if we knew their quarrel with our architecture, though it would also be nice if the meatheads that comprise our cast showed any interest in the beasts in front of them. Eventually, the knowledge that they are not dissimilar to us is brushed away and ignored. Hell, even in the execrable “Battle: Los Angeles” they had a scene where they autopsied an alien. If these visitors are legit, then the humans’ long term plan seems to be mutually-assured destruction, particularly considering the predictable post-credits sequel tag. Which is irrelevant, of course, since four people saw this movie. Most galling amongst this year’s blockbusters was “Prometheus,” which pretended to ask the bigger questions about our existence through a faded director and a creaky thirty four year old franchise. 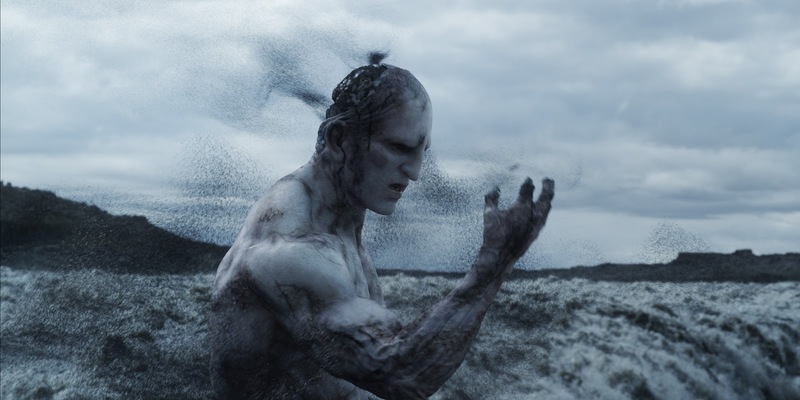 “Prometheus” tracks the origins of life to an interstellar group of albino bodybuilders who arrive on each planet and seed themselves into the atmosphere. However, a group of scientists soon find out that there may be a signal that’s been left for them over thousands of years suggesting (extremely tenuously) that these beings want to communicate with us. Or maybe it’s a dare. Or a warning. Or a taunt. None of these theories occur to pompous industrialist Peter Weyland, who spends a good trillion of his late twenty first century fortune to charter a ship to a distant, inhabitable planet we’re supposedly meant to find. Once there, the smartest of a particularly dim group of scientists eventually come face to face with one of these albino bodybuilders, referred to as Engineers in a similar way that the aliens from “Alien” are now called xenomorphs. Before this face-to-face, they collectively realize that this planet has long been abandoned, and that the Engineers have only left behind biological weapons of mass destruction, some of them intended for Earth. What this all means seems a bit sketchy, but that’s sort of the M.O. of this film, particularly in regards to what these scientists were expecting -- though a more cynical reading suggests these dim bulbs expected to come face to face with an Engineer for a friendly chat about why they’re here. Once they arrive on the planet, it’s genuine First Contact. We find alien corpses, alien remains, alien sacrificial chambers -- all discoveries that would rate, even considering the film‘s futuristic timeline, as the greatest discoveries in the history of mankind. Instead, one character sulks because the aliens are all dead. Another is sullen that she has no answers as to why they were invited. And most, if not all of them, are unconcerned about contaminating the planet, or it contaminating them, as if “breathable air” was the only consideration that needs to be taken into account. No one is interested in this planet’s eco-system, its rough terrain, its seemingly-arbitrary sandstorms. When one sees what looks like an alien snake, his first response is to reach out and pet it -- probably somewhat unscientific behavior. You’d wince if that were the stupid neighborhood kid, never mind a scientist on a trillion dollar expedition. 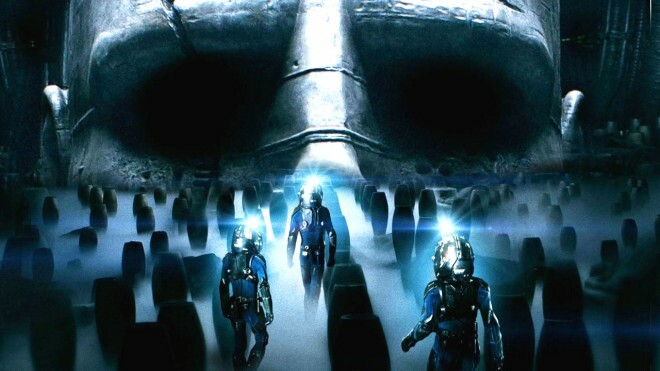 While one eagerly waits for these issues to be addressed on the “Prometheus” feature-length fan commentary that would hopefully accompany the DVD release (Drink every time someone says, “Put your helmet back on!”), the most glaring moment is the final face-to-face with the remaining Engineer. They wake him (her?) from stasis and, still recovering, he finds his bearings only to see he’s surrounded not only by humans, but one of our own creations, the android David (Michael Fassbender, Fassbulous). Weyland, fulfilling his main intentions of this trip (theoretically - the text doesn’t do much to support this or any theory about his intentions) asks David to speak to the Engineer, requesting “more life,” whatever that is. Whether something is lost in translation is not known, because the Engineer reacts to this message (untranslated to the audience) by tearing David’s head off and beating Weyland to death with it. This improbably cartoonish bit of violence, which contrasts with the Engineers’ seemingly peaceful manner, is probably more at home on an episode of “South Park” or as a “Mortal Kombat” fatality, and it feels more like a tremendous waste of energy for such a highly evolved being to suddenly become a wrestler. The question as to whether these Engineers created us (we share a 100% genetic match with them according to our Earthbound technology, which is… dubious?) seems appropriately ambiguous until it’s combined with the Engineers’ intentions to send these biological weapons (which, in an elaborate turn of events, create an ancestor of the xenomorphs) to Earth. So we don’t know why they created us, and we don’t know why they seek to destroy us. Question: is there anything we do know? Of course, “Prometheus” commits the sin not of refusing to disclose these answers, but by pretending these answers are somewhat attainable. These Engineers are light years beyond us. This distant world, which took us a couple of years at light speed to reach, is just a satellite planet to them. And they’ve created a black ooze substance that can significantly alter our physical and mental mindsets. For these scientists to arrive on this planet and pretend they were going to get explicit answers to the questions of our creation is extremely dim. And to suggest they’d be unhappy not receiving these answers because they’re arrived at an abandoned Engineer outpost gets to the heart of what’s possibly behind this lack of intellectual curiosity of alien life in today’s blockbusters: narcissism. Their discovery is astronomical, and yet, what are they more concerned about? The origins of an ancient alien race that precedes us by millenia, who have left behind endless amounts of evidence? Or the answers as to why they exist, and why they’re being targeted to be destroyed? Without any scientific background, one can surmise the great skill of being a scientist is to know which questions to ask. “Why am I here?” probably doesn’t rank high on the priority list when you could possibly be asking, “Who are these people? Where do they come from? What are they? What makes us similar?” The last question, especially, leaves much room for interpretation considering what we‘re given from this film -- look, we‘re both great at creating weapons! What’s more, “Prometheus” has an ending that superficially echoes “Close Encounters Of The Third Kind” while ignoring the utter selfishness of the participating characters. Left as the only survivors, Elizabeth (Noomi Rapace) and the disembodied head of David get into one of the remaining alien aircrafts under the assumption David knows how to pilot. Having just thwarted what they believed to be an attempt by the (possibly?) last remaining Engineer to destroy Earth, they’ve got a world of evidence that hasn’t been seen by humanity, as well as actual Engineer tech which is no doubt light years beyond us. Think of the advantage of piloting this ship to Earth. Sharing these technologies could make humanity a richer species, teach us more about these apparently-genocidal Engineers, and save lives. But no, Elizabeth must know. She must know why they want to kill us, why they created us, and who we are (and by extension, who she is). Arriving on an abandoned planet provoked a single Engineer to try to take off for Earth with the intentions to destroy. Once Elizabeth gets to one of the Engineers’ home planets, does she think they’ll react differently? She could in fact be furthering the Earth’s destruction. And considering the Engineers reportedly last arrived some 2,000 (sic) years ago and were not pleased by what they found (hint? ), what will they make of the cross that Elizabeth still wears? Contrast these bigger budgeted efforts with the recent Spanish film “Extraterrestrial.” In this movie, directed by Nacho Vigalando, a group of humans deal with the arrival of a UFO floating over their city through suspicions and infighting. There’s a strong romantic triangle element (possibly a rectangle), though, without addressing it, the alien situation affects our characters philosophically. As the film refuses to reveal the truth, we’re left guessing which of these erratically-behaving people might actually be aliens, and how they’re attempting to mimic human behavior. Of course, the lies and deception between them, relatively mundane stuff, are only magnified by this huge emergency, as these characters are all caught in a ruse, the act of Pretending To Be Human, alien or not. Because of these melodramas, “Extraterrestrial” indirectly addresses what it means to confront aliens, what it means to find those from another planet, whether it be a jealous would-be lover, a mysterious interloper, or a woman. Without revealing too much, it’s climax seems to confirm what should be understood by all of us: we’re ultimately all from different planets anyway, and to not be curious of such a fact is a moral failing that Hollywood is all too comfortable showcasing.